What do you get when your favorite comfort foods hang out? 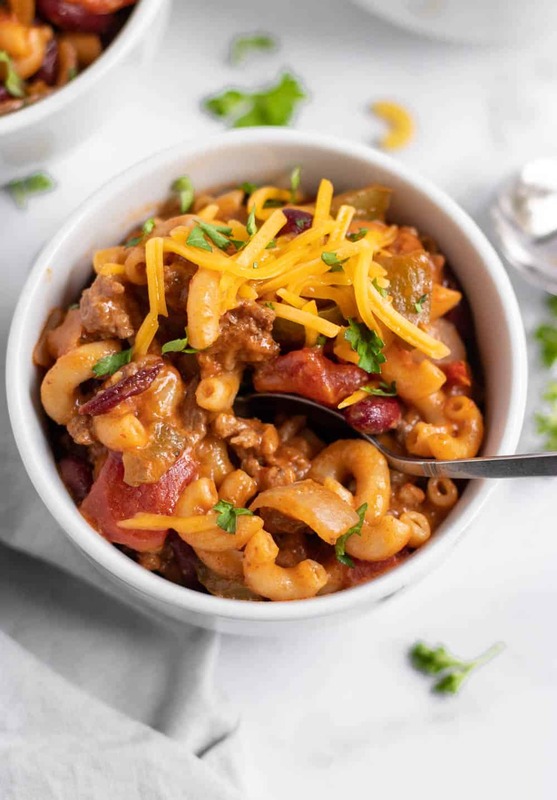 Simple and delicious One Pot Chili Mac and Cheese! An easy weeknight dinner without any extra dishes or mess! What do we want?! 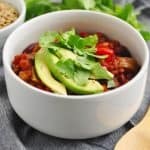 One Pot Dinners! When do we want them?! Every single day!!! That’s right friends, it’s what we want and today, it’s what we get. Too many dishes to make one dish for dinner is just not something we want to deal with. If a meal can do it all without making extra clean up, then you know I am in. 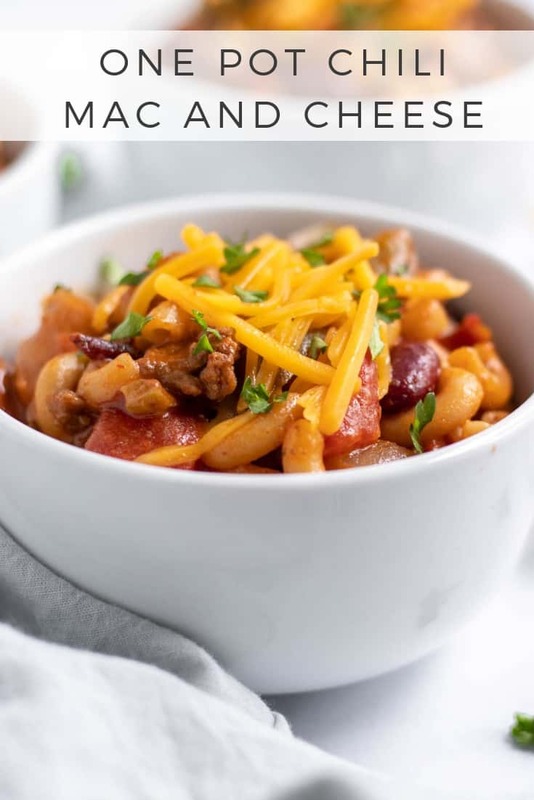 And this One Pot Chili Mac is the latest recipe to add to your simple dinner collection. Our toddler ate this meal by the fistful so technically I should be able to write that and then say “The End,” but if you know me, then you know that it’s never that short and sweet. Ha. It is getting late though so I won’t stick around too long today. Recently I was randomly thinking about Hamburger Helper. No idea what brought the thought of it, but I do remember having it at times as a kid. I had a big craving for something with noodles, meat and cheese, and I had Hamburger Helper nostalgia to thank for it. Who knew! I don’t know what it is about macaroni noodles but they just make you feel young. 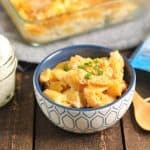 Or maybe it’s just that there are so many comforting memories of Mac and cheese–it’t gotta be one or the other! So what do you get then when you combine two AMAZING comfort foods? Like there HAS to be a name for it. I mean if there are Super Foods, then certainly Super Comfort Foods must be a thing. That’s exactly what the combination of chili an d macaroni and cheese is. Super comforting goodness! The measurements are based off of using regular elbow macaroni pasta. If you decide to use another pasta, it’s likely that you may need more or less liquid. Just keep a close eye on it after adding the pasta. 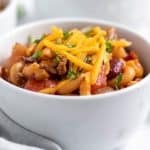 Cheese lovers: I used 1 1/2 cups of cheese in this recipe, but there is nothing wrong with adding 1/2 cup or more if you really want a stronger cheesy flavor. Technically we added some on top that could have been added in when cooking instead. 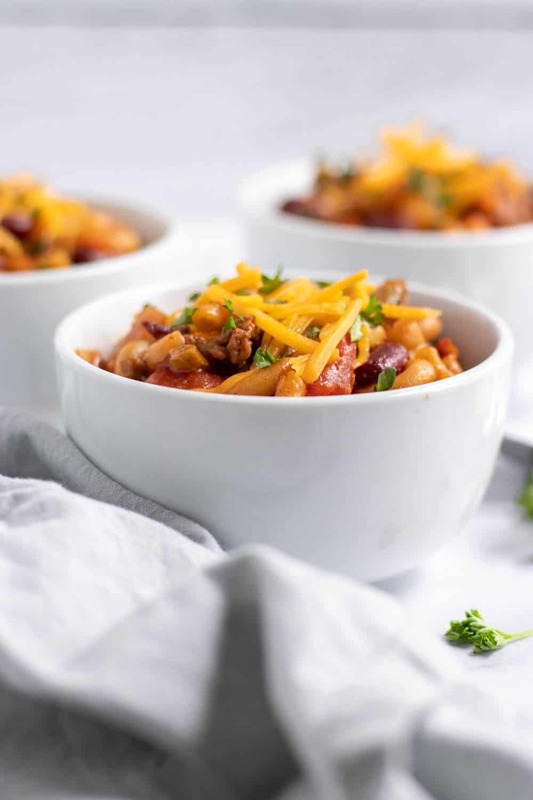 You don’t have to use ground beef for this recipe. 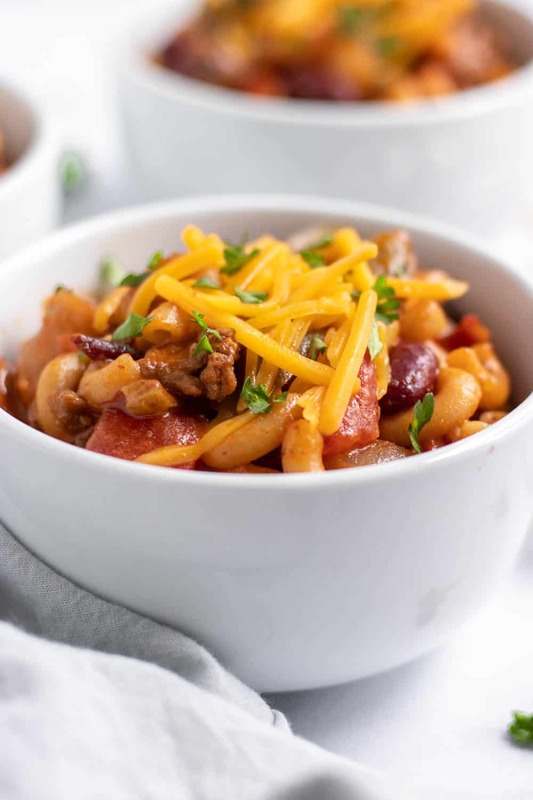 You could certainly use ground turkey, chicken, or even a vegetarian ground meat substitute. Any should work just fine! Feel free to play around with the heat on this one. I tone it down a bit for Sam, and then add some extra hot sauce or red pepper flakes when the hubby and I dive in. 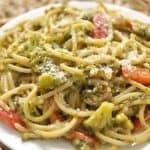 In a large pan or pot, add a drizzle of olive oil and allow to heat up. Add in onion and pepper and cook until onion begins to become translucent. Add ground beef and cook until browned and cooked through. Make sure to break up any large chunks. Drain if desired to get rid of excess oil. Add in tomatoes, garlic, kidney beans, chicken broth, chili powder, cumin, oregano, red pepper, salt and pepper. Turn heat to medium and cover. Allow to simmer for several minutes to slightly thicken. Add in macaroni and cover once again. Heat another 13-15 minutes or until macaroni is al dente, stirring occasionally. Before serving, stir in cheese and allow to melt. Enjoy with your favorite toppings!